It’s becoming increasingly clear that, despite the fact we can watch anytime, we continue to gravitate to traditional prime-time hours. And that is regardless of the device we are using. Data from comScore shows that however we watch video, the most frequent time for viewing is between 8 and 11PM each night. Television, of course, has lived by primetime for decades. However, it looks like the DVR was made for it. In the peak viewing hour, 9 to 10PM, 17% of household DVR viewing takes place. 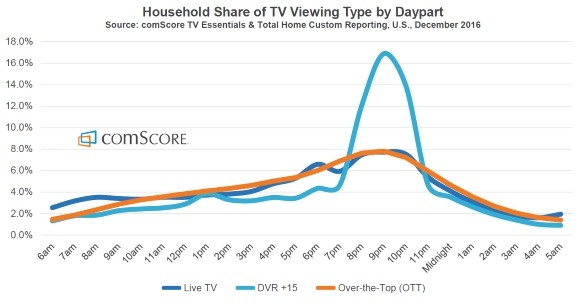 Both television and online viewing see a much smaller peak, about 8%, occurring in that hour. The BBC confirms that the peak of on-demand viewing occurs at almost the same time as regular television viewing. At 9PM, TV viewing peaks with 27 million viewers. The peak in iPlayer usage occurred slightly earlier in February 2017. There were 763,000 iPlayer TV requests about an hour earlier than the TV. Unlike TV viewing, however, the peak in iPlayer requests is sustained much longer, through until about 10PM. Incidentally, the BBC points out that the Internet peak, which includes all consumer usage, not just video, occurs at 4PM. 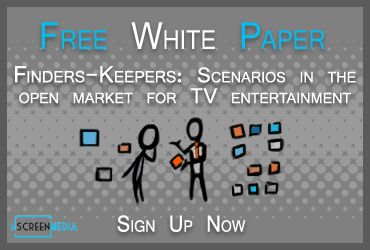 In the recent free nScreenMedia white paper The Secret Life of Streamers, new Conviva data reveals that primetime is peak viewing time regardless of the screen used. The two biggest screens, the connected TV and the PC, show the biggest peaks at 9PM each night. During that hour, connected TV video plays are 2.7 times higher than in the average hour. PC video plays are 1.7 times bigger than average hour plays. The tablet and smartphone peaks are twice the average hour plays for each device. This data reflects the very different usage patterns for each of the connected devices. 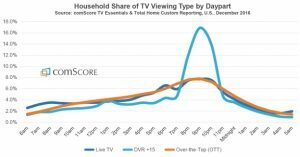 The connected TV is a favored device for consumers to turn to when they want to enjoy their favorite shows on SVOD. For example, Netflix reports most of its viewing is on connected TVs. Whereas, the smartphone is used more consistently throughout day. When it comes to nighttime viewing, consumers turn to the biggest screen at their disposal to watch high value content. One interesting thing to note about the PC is the peak in viewing that occurs around noon each day. This may suggest that a favorite lunchtime activity at work is catching up with a favorite show, or the latest YouTube video. Viewers continue to gravitate to the biggest screen available between 8-11PM. The other thing to note from the Conviva data is that meaningful viewing volumes occur through other screens during primetime. Though video starts to the smartphone at 9PM are 20% of the connected TV, a significant part of the audience is watching through the smaller screen. This shows that lack of access to the big screen does not deter viewers from watching their favorite shows at prime-time! Prime-time looks to remain the primary time we watch video. At least, as long as our personal schedules are dominated by the rigors of work and school. Though how we watch may change, when we watch remains the same. Even as people transition to digital platforms for viewing, they continue to reserve the lion’s share of their viewing to prime-time. This is true regardless of the source of the video, and the device upon which it is being viewed. I don’t think its obvious through every screen. For example, the PC sees a peak almost as big as at prime-time, but at lunchtime. Is it obvious that smartphones see maximum usage during prime-time too? It will be interesting to see if this remains true for the smartphone as more mobile data plans become uncapped. Could we see a shift for that device to commute times, or breakfast?